Provide comfort for the family of Gwendalyn Coureton with a meaningful gesture of sympathy. Gwendalyn Ra Coureton, age 78, of Joplin, passed away on Sunday December 2, 2018 at Freeman Hospital in Joplin. Gwendalyn, daughter of the late Frank and Theresa (Chipp) Gust, was born on January 29, 1940 in Belleville, Mo. She was a graduate of Carl Junction High School and attended administrative assistant training after graduation. 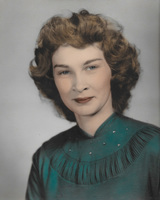 She was employed for several years at the Hanes Rexall Drug Store in Joplin. She attended the Second Assembly of God in Joplin. Her passion was helping and caregiving for others. She will be remembered by her family for her astounding flower gardens and gardening skills. Survivors include, one sister, Marjorie Countryman, of Joplin; one nephew, Gary Countryman, of Miami, Ok; one niece, Janice Foster, of Miami, Ok; and several great and great-great nieces and nephews. In addition to her parents, she was preceded in death by one nephew, Frank Muller. Funeral services will be held on Friday December 7, 2018 at 1:00 pm at the Second Assembly of God in Joplin with burial to follow at the Wirtonia Cemetery near Crestline. The family will receive friends from noon until service time at the church. Arrangements are under the direction and care of Mason-Woodard Mortuary and Crematory in Joplin. To send flowers in memory of Gwendalyn R. Coureton (Gust), please visit our Heartfelt Sympathies Store. We encourage you to share your most beloved memories of Gwendalyn here, so that the family and other loved ones can always see it. You can upload cherished photographs, or share your favorite stories, and can even comment on those shared by others. Provide comfort for the family of Gwendalyn R. Coureton (Gust) by sending flowers. We grieve with you in the loss of your sister and our good friend, Gwennie. Her friendship over the years blossomed just as easily as her flowers did. She blessed us with her affection through cards, letters, visits and beautiful bouquets from her garden. She always witnessed to us about her faith and love for the Lord Jesus. This shining spirit of God's love will be a wonderful memory of Gwen from now on. We are sorry for your loss, and we share in it. But we are confident of Gwen's joy in the presence of her dearest friend, Jesus.